How to make family dinner special on Valentine’s Day with a candy inspired and family friendly table setting. Inspired by kids and conversation hearts. I'm excited to be participating in a blog hop with some Canadian blogger friends, organized by the lovely Jo-Anna from A Pretty Life in the Suburbs. Links to all the posts can be found at the end of this one, or search social media with the hashtag #CBValentinesDay. 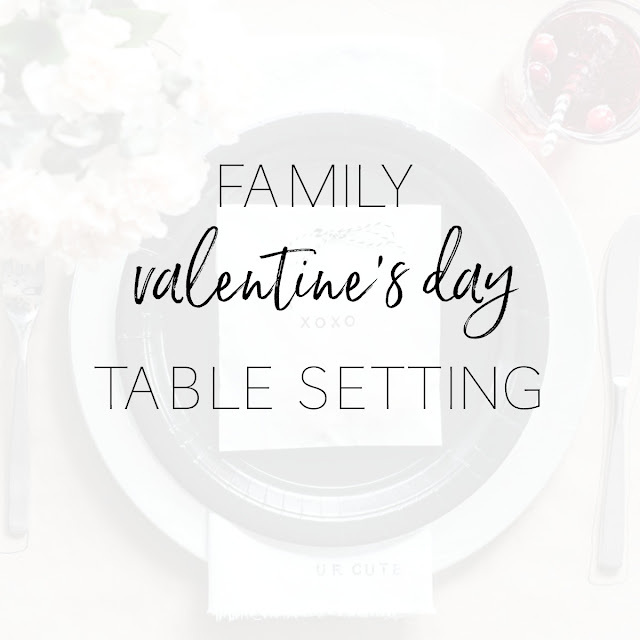 When Valentine’s Day falls on a weekday, it can be tricky to do anything special because of work, school and after-school activity schedules. 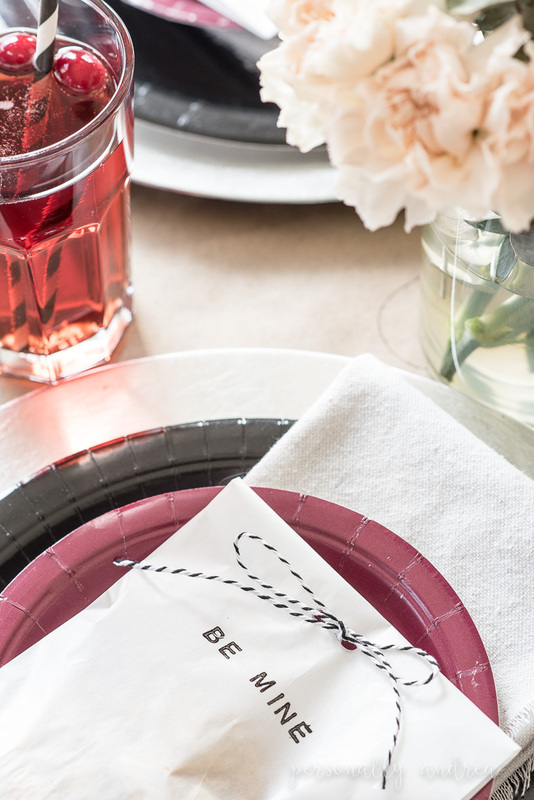 Here are a few ideas to help celebrate the occasion without breaking the bank and while still being able to watch the clock. I was inspired by the Valentine's conversation hearts candies, which I think taste terrible, but have the iconic Valentine's messages on them. I used items from around the house where I could, and made a few things too. Whoever invented having a paper tablecloth in a family restaurant was brilliant, so why not do it at home and pretend it's like a restaurant? This is simply two pieces of kraft paper cut from a large roll which I always keep with our wrapping paper. I printed mine with some heart shapes. I pressed the edge of a cookie cutter into my inkpad and stamped randomly over the paper. Leave out some crayons if your kids (big or small) will use them. I have a stack of these silver chargers that I use for all occasions. They often go on sale (buy one get one free) at Michael's and come in assorted metallics. Nothing says I'm in a rush *party* like paper plates. You know when you buy them there will always be some left over, and this is the time to use them. I try to buy them in solid colours instead of the themed ones. That way they're versatile to be used on other occasions. 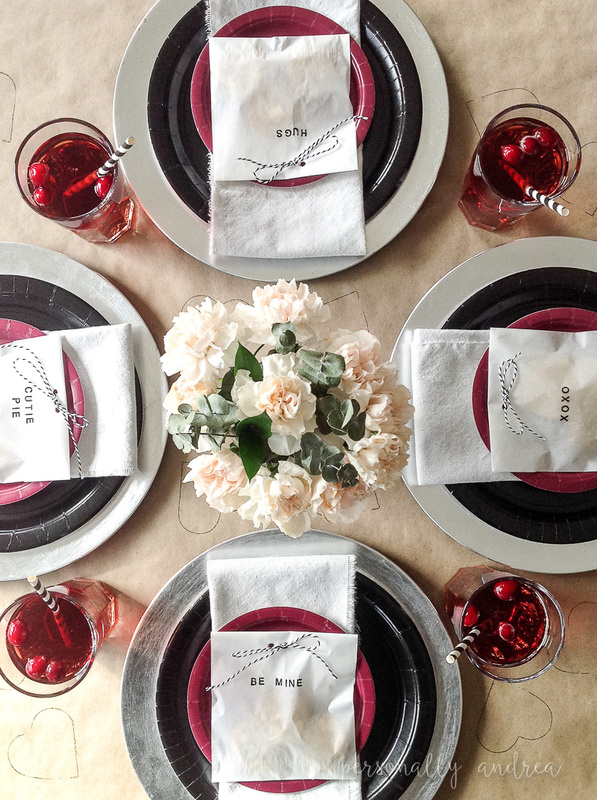 Here's a little DIY where I brought in my conversation hearts theme. NO-SEW!!! 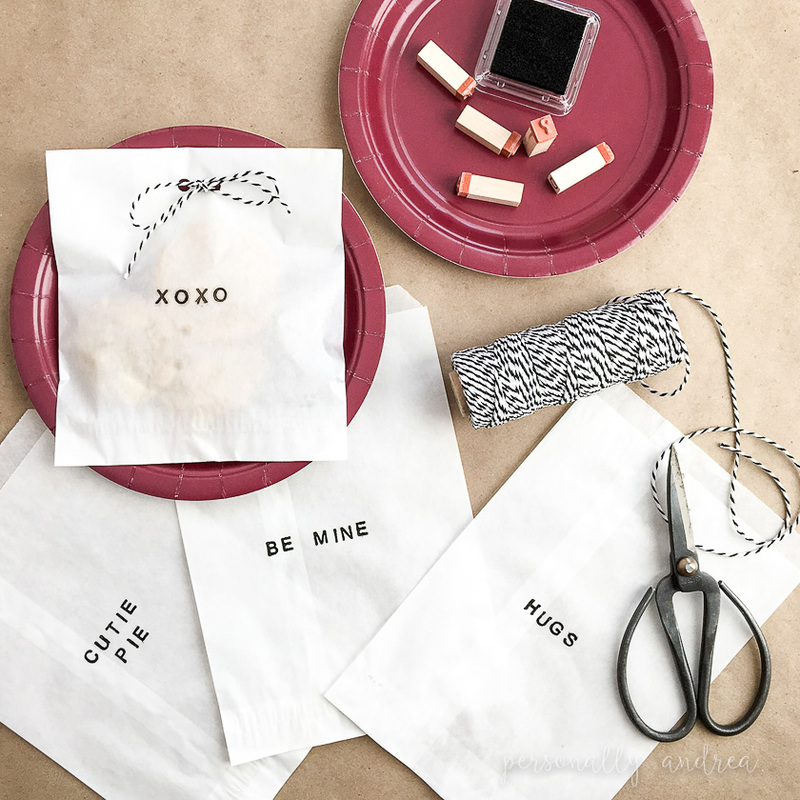 Each napkin is stamped with a conversation hearts saying, for a whimsical and family friendly way to do cloth napkins, even on a weeknight. No need to buy coloured paper napkins for every occasion. These make even a weeknight dinner feel fancy, and can be thrown in the laundry instead of the garbage. I'll post more details on how to make these next week. 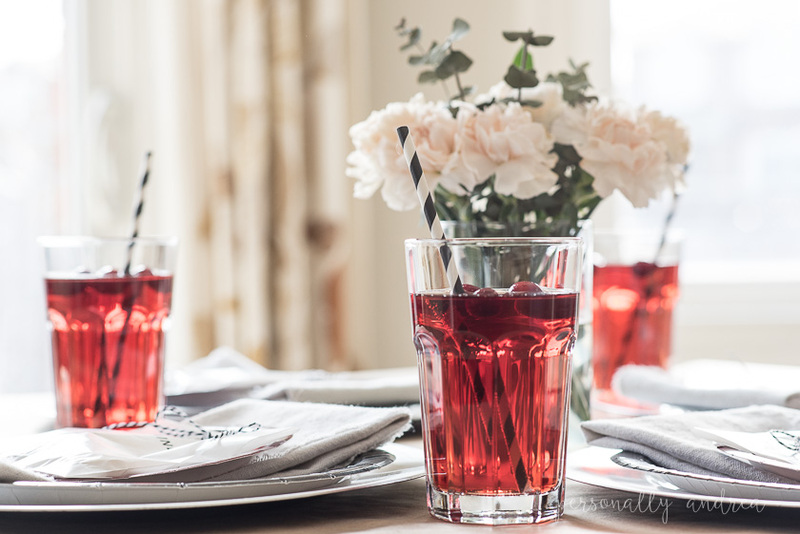 A fizzy drink with a paper straw makes a family dinner feel special, so why not indulge them for Valentine's Day? This is simply cranberry juice with some ginger ale added for sparkle. A little craft, also inspired by the conversation hearts Valentine's candies. I tucked a few cookies (these sugar cookies are my favourite for Valentine's Day) into a glassine bag stamped with a conversation hearts saying, then folded it shut and tied it with bakery twine. It looks fancy and can be taken "to go" if there are after-dinner activities on the schedule. 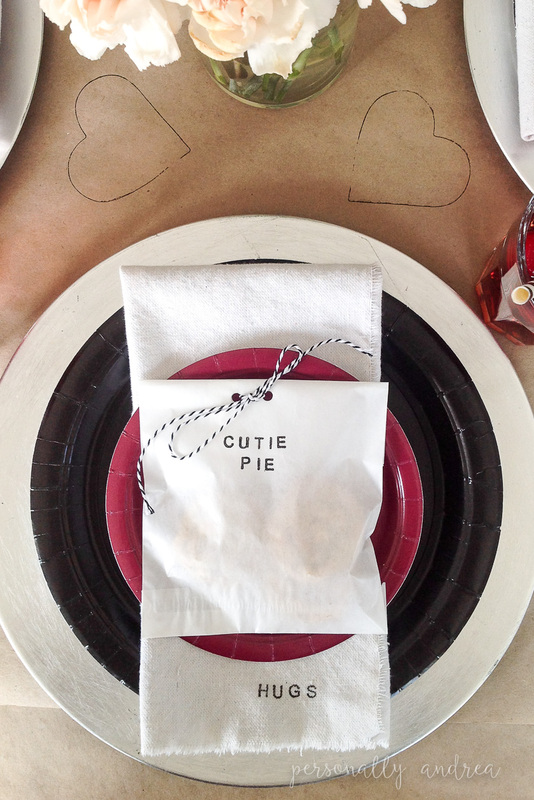 A plain white or kraft envelope would work too, with any kind of Valentine treats inside. 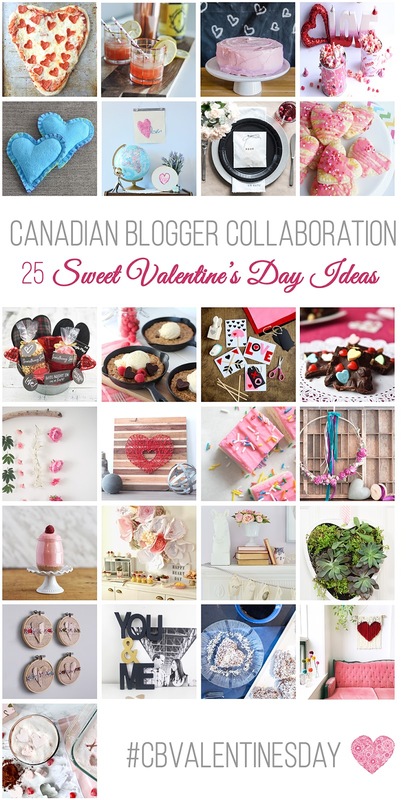 Now if you're looking for more food, drinks, activities, decor, and all things Valentine, be sure to scroll through the blog posts listed below. Another set of posts will be going live every day this week, so be sure to start with yesterday's posts, and check back later in the week as the rest are posted. Enjoy!